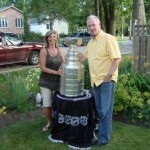 This past weekend I was fortunate enough to go to a gathering with none other then Mr. Stanley Cup. 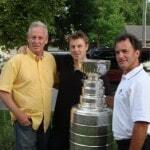 We headed up to Mitchell where the cup was arriving with one of the towns prodigal sons. Right from our arrival it was impossible to miss the cup. Standing in the corner proudly illuminating the backyard with his luster, it engulfed your attention immediately as crowds marveled in a respect and admiration that was truly remarkable. How does one meet Lord Stanley? Well, conveniently on Thursday night my lovely sister in law called my family and informed us that her brother Jay Heinbuck, who by trade just so happens to be the Director of Amateur Scouting for the Pittsburgh Penguins, would be endowed with the mug for the entire day Friday. As many Canadians and hockey fans know, one of the traditions of the cup allows for players and major management to spend a day with sports most famous and travelled trophy. As one can imagine Stanley has ended up some pretty odd predicaments over the years! Since 1995 when the tradition officially started players and management have brought the cup across the planet going not only traversing Europe and North America but also on humanitarian efforts in Iraq and Afghanistan. After winning Defensemen Sylvan Lefebre even used the cup to have his daughter baptized in. It is one of the greatest and most adventurous traditions in sport. It was a magnificent sight and truly a piece of Canadiana. While admiring the smiling faces and reverent behaviour around Stanley’s presence it was clear as day to see what this thing really meant to Canadians. When it was my turn with the cup I was amazed with how old the thing really looked. And of course this is not meant in a derogatory manner at all, it was more of a nostalgic type of old. As if this inanimate object had years of wisdom on all of us. I stopped and glanced quickly at some of the names and realized how many of my boyhood hero’s and legends that I had only been told about had hoisted this trophy. It was truly a special moment and one that will remain with me forever. As I looked at all the names I wondered how many of them have used chiropractic. I think there should be a name on the cup for chiropractic as it has helped countless athletes over the years compete at their highest potential. It transcends all sports and helps people function at their best. My curiosity aside it was truly a magical moment that no fan or patriot should ever pass up. From the youngest of children dreaming of game 7 glory, to the eldest lifetime fan everyone stood in amazement of this monolithic structure of bravery, teamwork, and sacrifice. What a sight to see….